This is a 2 hour work shop, $35 a person and comes with all the materials needed. It’s designed for those wishing to learn to do henna well enough to enjoy using a home kit. You’ll be able to do henna on yourself, friends and family. This class teaches you the basic application process, how to fill a cone, do lines and filled designs, aftercare and how to make a transfer. Using transfers allows you to work above your artistic level insuring your designs come out looking nice. You can book a private class for just you and your friends with a 6 person minimum. I’ll come to your location (a $40 travel fee may apply). 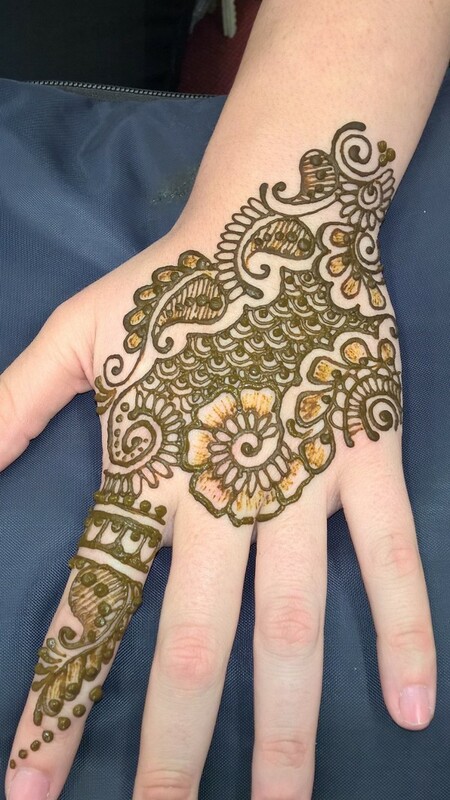 Check our events calendar to participate in one of our open Hands On Henna classes. This is a 2 day intensive and is $480 a person. 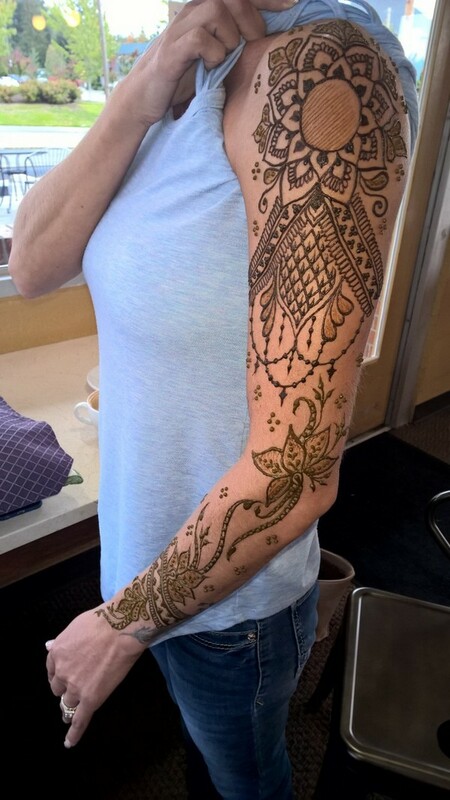 This class teaches you more then just how to do henna. It has a strong focus on using the applicator to perfect designs, techniques on drawing so designs stay clear and balanced and training the eye to break them down. Once you learn these applications, you can do designs you've never practiced before as well as different styles. Tattoo style artwork is the most popular but is also the hardest because it takes drawing skills. Skills that you'll have after taking this class. It is often taught one-on-one and takes no more than 4 students. The purpose is to train people who intend to charge for their work. The Professional Artists Kit comes with the class and is a complete start up kit for your new endeavor. Check the EVENTS page for available dates. Feel free to contact Krysteen for any reason. Or, to book an event or to inquire about dates available . . .
A great addition to this course is the DOWNLOAD VERSION. It is a review of every important step and can help you practice after the class. PRO-CLASS VIDEO is a complete step-by-step guide to the Professional Artists Class. It comes with the Professional Artists Kit and is $180. This video was developed for those unable to travel to Seattle for the 2-day Professional Artists Class. It has gotten rave reviews as a teaching tool. With the download and kit purchase you get $100 off the Professional Artist Class if you feel you'd like the one-on-one instruction.